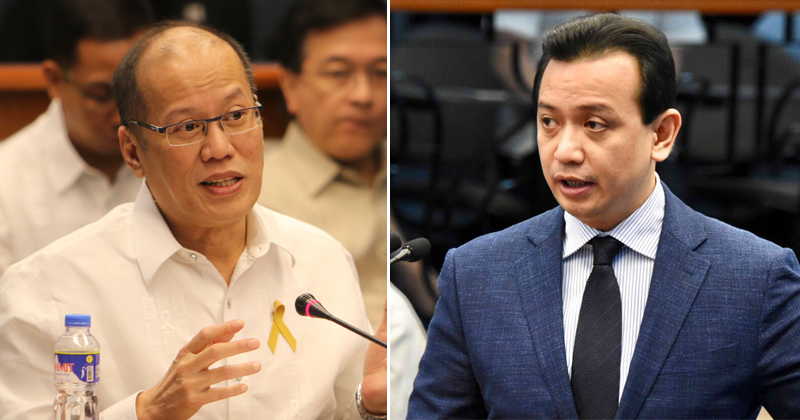 Former President Benigno Aquino III believes that amnesty granted to Senator Antonio Trillanes IV should not be voided, as it represented the honor of the state. Aquino on Tuesday warned that such a move could affect the trustworthiness of the government when dealing with other groups. "Baka wala nang maniwala sa amnesty," Aquino said in a report by Mariz Umali on State of the Nation with Jessica Soho. "Parang honor na ng estado 'yan eh. Ipinagkaloob na sa inyo. Ang kapalit noon ay mananahimik na kayo," he added. Trillanes and the other Magdalo soldiers were able to avail of amnesty by virtue of Proclamation 75, issued in November 2010 by Aquino. They filed their amnesty application before the Department of National Defense on January 5, 2011. Aquino maintains that the amnesty is valid. He made the position in response to President Rodrigo Duterte's Proclamation 572 which states that the amnesty extended to the mutineers was void from the start because he did not comply with the "minimum requirements to qualify under the amnesty proclamation." But Aquino said that application for amnesty meant that there was admission on the part of Trillanes of guilt. "When you apply for amnesty, nag-apply ka kasi you were there, you participated in those acts, you were part of that and therefore you are applying for amnesty," said Aquino, who questioned why Trillanes, a staunch critic of Duterte, was being singled out. "Kung si Trillanes may crime at ang ibang kasama niya equally charged, kung void ang amnesty kay Trillanes, void din ba sa lahat?" State prosecutors have filed a very urgent ex-parte omnibus motion for the issuance of a hold departure order — which would bar the senator from leaving the country — and an alias warrant of arrest against him. Acting Armed Forces chief of staff Lieutenant General Salvador Mison has also ordered the formation of a new general court martial that will hear the charges against Trillanes. Trillanes' camp said it will file for legal remedies on Tuesday.